No announcements available at this time. Please be advised of the temporary deviation, which is proposed to be instituted at the Crompton/ Shepstone Road Intersection in New Germany. Construction in this area will begin at 07:00 on Saturday, 1st April and will end at 17:00 on Sunday, 2nd April. A new water pipe will be laid across Crompton Road during this time period. Motorists will have access to Crompton Road from Shepstone, but the road will be reduced from four lanes to two. One-half of Crompton road will be closed and traffic will be placed on the other half. Once work has been completed on the first half, traffic will be placed onto the previously closed area until the whole job is complete. 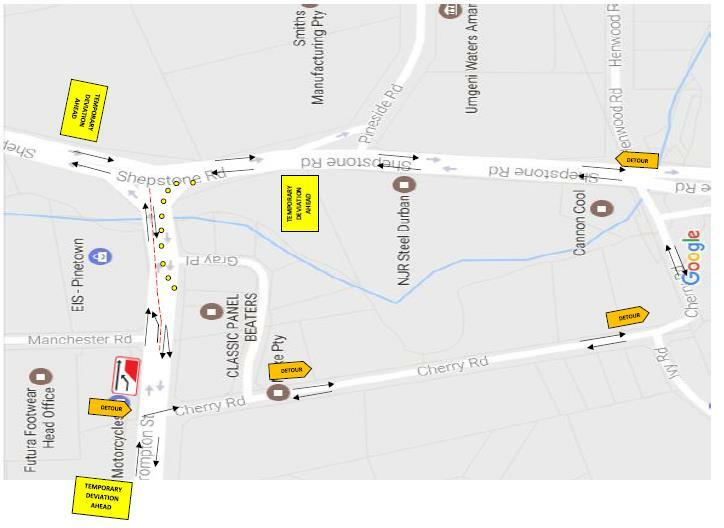 Motorists can also access Shepstone road via Cherry Lane if they wish, this route is indicated by the detour signs on the diagram. Motorists are requested to use the alternative routes on the affected days to avoid delays. Your patience and understanding will be appreciated. © 2019 GoDurban. All rights reserved.